Alex Nunez, Scout Master Dwayne Cox, James Martin, Adam Campbell, Bobby Bloomfield, Joseph Ramsay and Ben Pulice. 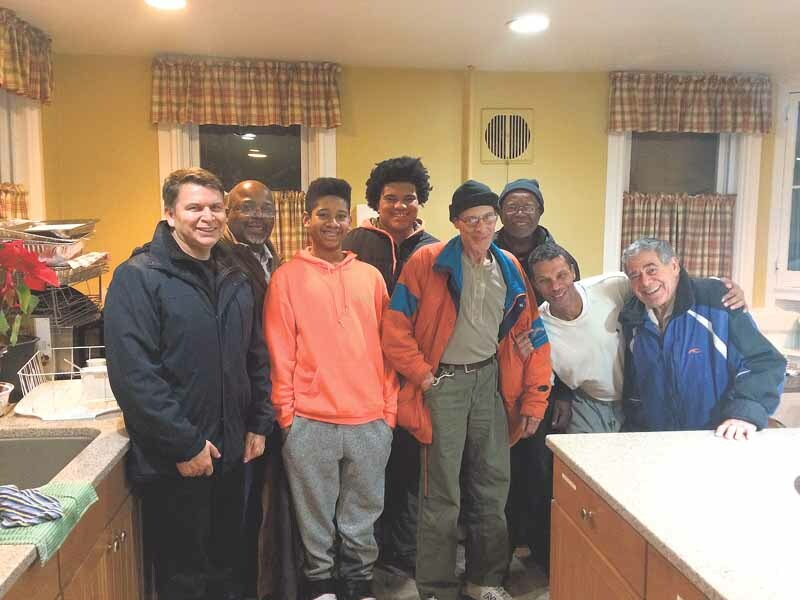 Guests who seek shelter through the North Shore Sheltering Program received an extra layer of comfort this winter, thanks to the generosity of Westbury’s Boy Scout Troop 233, and in fact, the 25 men served by the shelter are once again experiencing goodwill from the community at large. The troop recently completed a service project where they took old discarded wrestling mats from Herricks Middle School and spent about five hours cutting and reconfiguring them as sleeping mats that were then donated to the shelter in Glen Cove—a gift that was much appreciated. While the shelter provides sleeping bags and other organizations have donated blankets, she said the mats are a welcome addition. Campbell noted that boys in the troop range in age from sixth through 12th grade, so each one walked away with something different from the experience of visiting the shelter. “It’s important for them to understand that the reasons for homelessness are varied,” said Campbell. The North Shore Sheltering Program is currently in the middle of its 21st season, and community support is stronger than ever. Hosted at the First Presbyterian Church of Glen Cove from Thanksgiving to the end of March, various community members provide the homeless men with a meal every evening while the church provides shelter from 6 p.m. to 6 a.m.
Christine Schaffner has been the head counselor for just over a year, managing staff schedules and hours. She’s one of six paid employees and while there are a few regular volunteers, Schaffner said the most common donation is the nightly dinner, which is donated every night from either an organization or a family. Volunteers will either make a meal or have it catered, bring it in and serve it. The contributions come from everyone: churches and synogagues, sikh temples and other houses of worship, as well as Scouts, families and schools. Some groups serve weekly, some monthly and others fill in as needed. Organizations such as the Kiwanis Club and the Lions Club are regular contributors throughout each season. In addition to the donation of the sleeping mats, Schaffner said the shelter also gets regular clothing donations of socks, underwear and undershirts, plus occasional coats, pants, shirts and other items. “It’s very helpful as it’s nice for them to have clean clothes to change into,” said Schaffner. The men also have access to hot showers, cubby holes in which they can store their belongings during the day, and volunteer nurses check on the men almost every day; the nurses can refer them to the hospital or give over-the-counter medications as needed. Gustavo Gitlin, president of the program’s board of directors, has been involved in the shelter for 13 years. The shelter began 21 years ago in response to the deaths of two homeless men found frozen one winter—the community came together as a way to prevent such a tragedy from happening again. Gitlin noted that people often question why it is a winter-only operation and stresses that the program sticks to its mission statement, which is ultimately about providing shelter and protecting people from the elements. Some find seasonal labor and are able to provide for themselves once the weather warms up. Gitlin said that over the years, the program has become very efficient and well-organized. Being an independent operation—they receive no additional funding from any government entity—they do their own fundraising and hold an annual fundraiser and open house each March. This year’s will be on March 11, from 4 to 6 p.m. So far, the community has shown its limitless support. Several years ago, the shelter was in danger of closing, but once word got out, they raised enough to carry them through a few more years. Those interested can sign up through the website, www.northshoreshelteringprogram.org.